Hookbill the Koopa is an enlarged Koopa Troopa in the game Super Mario World 2: Yoshi's Island and its remake. He is the boss of World 4 and resides atop the castle of that world. When Blue Yoshi and Baby Mario reach the bridge on which Hookbill is fought, a fog envelops the area, dissipating on the other side. Blue Yoshi and Baby Mario then encounter a normal Koopa Troopa and Kamek, who casts his magic on the Koopa. The Koopa Troopa retreats into his shell, which grows. After the transformation is complete, Hookbill re-emerges from his shell. Walking on all fours, he creeps towards Blue Yoshi to attack him and Baby Mario. After walking on all fours for some time, he stands up and runs in Blue Yoshi's direction and lunges at the dinosaur. Blue Yoshi then must dodge the attack in order to avoid getting hurt. To defeat Hookbill, Blue Yoshi must first throw Yoshi Eggs at his head or arms. Jumping on Hookbill's shell or head will cause Hookbill to cough up eggs for Blue Yoshi to use in case his supply gets depleted. After four hits while on all fours or after three hits while on two legs, Hookbill will fall backwards and will be briefly vulnerable to attack. Blue Yoshi must jump on and then ground pound Hookbill's exposed stomach, delivering damage to Hookbill. After this (or after a certain amount of time passes), Hookbill will recover, retreat into his shell, and begin pounding the ground. He will then re-emerge, and the process will have to be repeated. Once his stomach has been pounded three times, Hookbill is defeated. His shell explodes and disappears, and Hookbill (with no shell) falls from the top of the castle. Hookbill the Koopa reappears in Tetris Attack as one of Bowser's allies in the game and speaks with a stutter. Here, he takes Phoenix's place of the original Panel de Pon at Stage 9, and unlike other characters, Hookbill does not have a personal ally of his own. 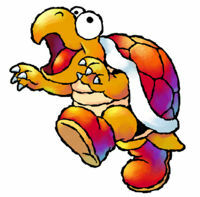 During the introduction to Yoshi's Island DS, Hookbill the Koopa makes an appearance alongside the other castle bosses in the game as the events of Super Mario World 2: Yoshi's Island are recapped. This page was last edited on March 27, 2019, at 15:58.